April 2019. Whilst reading hillbilly.com the other day I noticed that an old friend had passed away aged 86. He was Pennsylvania’s King of Country Music, Cowboy Howard Vokes. I first met him in 1961 when visiting the DJ convention in Nashville, a guest of Lou Epstein the manager of Jimmie Skinner’s Record shop and Jimmie’s personal manager many years before. Howard was one of the greatest promotional people that you’ll ever come across and was always there to give a helping hand to any fellow Country Music performers. He gave me a lot of introductions over the years and was always someone I could call on for assistance or information; a true gentleman and it is with great sadness that he is no longer with us. Sad also to hear of the passing on April 6th of Jim Glazer, the youngest brother of the legendary Tompall & The Glazer Brothers – three brothers who had a massive influence on the country scene from the 1960s onwards not just through their fine harmony recordings but also through their successful publishing and studio businesses. 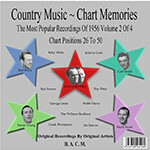 Back to BACM news, well life goes on and we’re still managing to put out our regular three CDs a month. There’s just one thing that gets under my skin is the postal services not working as well as they should. One guy in Canada was recently kept waiting for about a month after we’d posted it. We post out orders promptly via Royal Mail and via Air Mail where applicable. Once the package has been posted, it is then in the hands of the postal service and if their system goes wrong it’s us who are left with the customer’s wrath. We do guarantee the service we give, so nobody looses but ourselves. My answer is, please have a little patience with them, they will deliver in their own time. So on to our releases for April. In the past our policy has been to avoid issuing tracks already issued on CD by other labels. But now, after producing over 600 CDs and nearly 18,000 tracks it becomes a bit more difficult to find good quality un-released tracks so we may have to change our strategy. We’ve done this for two of our releases this month. 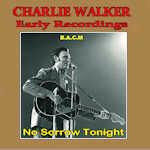 Our Charlie Walker CD gives you the earliest of his work on such labels as Imperial, Mercury and Decca, tracks that you can also find on Bear Family’s superb but expensive box set which has all his releases along with a book with hundreds of photographs & information. You can treat our CD as a sampler, showing what a wonderful artist Charlie was and if you like it, by all means go out and buy the box set as well, so everyone is a winner. We regard these other labels not as competitors but as our friends who, like us, are doing their best to maintain the legacy of the great country artistes of yesteryear. 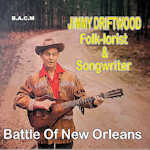 Similarly with our Jimmie Driftwood CD – giving you 28 of his songs from the late 1950s and very early 60s to wet your whistle. Bridging the gap between country and folk in his early days he became popular with songs like Tennessee Stud and Battle Of New Orleans which just about everyone was singing some 70 years ago. 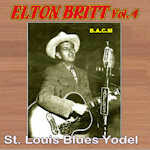 Finally we have another CD by the great Elton Britt, our 628th CD. Here you’ll find a lot of sentimental songs to prove that it wasn’t just his yodelling powers that made him famous but he had such a fine voice that suited almost anything he put his voice to. We’re already working on the three releases for the month of May; as usual we are not giving you any clues about them because our subscriber customers tell us they enjoy opening each month’s package and the surprise factor. Here’s wishing you all our very best wishes in life. THE BACM BOYS, Dave Barry & Brian, plus our sidekicks who do a splendid job.